Whenever I’m asked the question, “How do we fix education?” I find myself emphasizing the importance of creating smaller learning communities within the context of the larger classroom. I passionately believe the most effective learning communities are those that allow teachers to spend more time working individually or in small groups with their students to customize and personalize instruction. Smaller learning communities also provide students with more opportunities to work collaboratively and engage in a variety of activities that appeal to different learning modalities (auditory, visual, tactile and kinesthetic). Students engage with the world in different ways, so it’s important to keep activities and tasks varied to ensure every student is able to receive and process information in a way that works for them. My interest in blended learning and weaving together learning mediums to include both in-class and online learning was in part driven by my desire to create smaller student-centered learning communities in my classroom. One strategy for a teacher interested in pursuing this approach come fall is experimenting with the Station Rotation Model–a blended learning model. The Station Rotation Model does exactly what the name suggests–students rotate through learning stations either on a fixed schedule or at the teacher’s discretion. At least one of the stations must be an online learning station for this to be considered a blended learning model. Learning stations are not a new concept in education, so this is an easy model for teachers who are shifting from a traditional teaching model to a blended learning model. Teachers can use this model within a traditional classroom setting by simply breaking students into small groups and having them rotate through different stations set up around the classroom or rotating the whole class through a series of learning activities. This model is flexible and can work with almost any age level or subject area. My classes are usually composed of 30 students, so I tend to design a minimum of 6 stations. That way my stations do not exceed 5 students, which feels like the maximum amount of teenagers who can be in a group and work together effectively. I have 90 minute block periods, so I typically have them work 12-15 minutes in each station or we break the work up into 2 days and they can have 25-30 minutes in each station. What is the objective of each station? Will students produce something? How much time do students need in each station? How long will they have to transition between stations? What materials do they need in each station? How many devices are needed for the online learning stations? Do they need any special programs, apps, or software? What will be the cue for them to transition to the next station? Will directions be frontloaded, provided in written form at each station, or presented via mini-video tutorial at each station? The online component can take many forms ranging from students using dynamic creation tools to researching topics to using adaptive software depending on the objectives of the lesson. However, the addition of an online component requires that teachers have access to technology in some form or another to execute the Station Rotation Model in their classrooms. I don’t have any actual hardware in my classroom, so I have to use student devices or arrange to take my students to one of our computer labs on campus. As a teacher, it takes more time to plan this style of lesson; however, the benefits far exceed the challenges. I love being able to work with a small group and provide real-time feedback, answer questions, lend support, or direct students to an online resource. Students also enjoy the freedom they have as learners in this model. I am not hovering over them or controlling the pace of their learning. They are driving the learning, which is much more powerful for them. A teacher does not have to use the Station Rotation Model for every lesson, but it is an easy way to explore the benefits of blending online work with face-to-face interactions to create smaller learning communities that are student-centered. Thanks for the diagram; really helped me out visualize your planning process! How often do you find yourself using the Station-rotation model throughout? I’m glad you found that helpful, David. I also like visually planning out my lessons. I typically use this model once every week or two. I’m hoping to do more with it this coming year. I had the same question, David. Catlin, you make everything seem so easy. I think one of the main things I’ve learned from you is the importance of planning. The visual map puts the process together for seemless implementation. I can really see your versions of stations working. Thanks for sharing with us! That’s a wonderful compliment, Marilyn! Thank you. 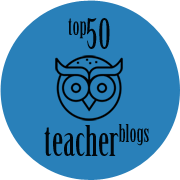 I’m so glad when other teachers can use what I am sharing on my blog. I passionately believe we can improve the quality of learning for every student if we share our best practices! This is really compelling; thanks so much for getting the wheels turning! Would it be possible for you to give examples of the tasks/outcomes for each station for, say, a literature or writing unit? I’ll work on a follow-up blog with examples. I’m presenting at a conference today and I’m focusing on a blended approach to reading in the classroom. I will put together an example lesson for differentiating reading in the classroom using the Station Rotation Model and post that. I will add a writing example to my list of future blogs too! 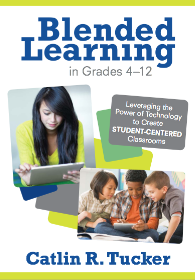 lso, I just purchased your “creatively teach the CC Lit Standards with Technology” book. I really enjoy reading your blog posts as well. The only blog I’ve written with an example is “Early Elementary: Differentiate Reading Practice.” I’ll work on a secondary example soon. I love this idea. I have actually experimented with it a few times but was a bit concerned about students staying on task in the different stations. Do you have tips on how to ensure they stay focused? Also, I see a few people asked you this already, but can you possibly give a few specific examples of activities you’ve done at individual stations that worked really well? I always position my teacher-led station at the front of the room so I am facing all of my students. That way I can keep an eye on the rest of the room. I also think it’s important to have some deliverable at each station. Otherwise, my normal management strategies are pretty effective. My Station Rotation lessons aren’t harder to manage. I think it’s because they are student-centered and engaging. Thank you for the information on and diagrams on how to set up a flipped classroom. I also found it helpful that in prior replies that you noted that you do this once per week or every two weeks, so that it doesn’t become too much of a daunting task. Thanks again! I’d plan a Station Rotation that spans 2-4 days. They do not need to rotate through every station in a single period. It’s a really flexible model. I typically set up four stations and span over our 100 minute block period day and our short 40 minute Friday. We do 3 stations on the block and the 4th on the Friday. This gives about 30 minutes per station with plenty of transition time. I really love the idea of a small classroom within a bigger class of students. But if each station allows students to work at their own pace, how can they switch/transit from one station to other at the same time ? I run 2 types of stations: fixed rotation and free flow rotation. In a fixed rotation, students move after a fixed amount of time. I try to plan those fixed stations so students have enough time to self-pace, but there are kids who do not finish. I never assign homework on a fixed station rotation night because students may need to finish some of the work at home. The free flow station rotation allows students to move through stations at their own pace. Click here to check out a blog on free flow stations. I’m struggling with the idea of movement if many of my stations are on the computer. It seems silly of have them log off and move to log on a different laptop. How do you handle moving from one techie station to the next? I typically encourage teachers to move students through online and offline stations since kids get burnt out on the screen. That said, if you have back-to-back online stations, I wouldn’t move them just to move them. You might want to consider “free flow stations” or a digital choice board instead. I typically alternate group vs individual work and analog vs tech stations. This week, my students had a small group poetry analysis (hard cooy), a quickwrite focusing on description, (in notebooks), a partner academic conversation about the novel we are reading, and a Study Sync online blast blended with research notes in their notdbooks. I teach second grade and I am learning about blended learning and how to implement into my classroom. I am working on using the station rotation in my classroom. I have taught two lessons using this model and feel like everything you said rings true with my students. I felt like I was able to work with smaller groups of students and really hone in on their strengths and weaknesses. I also felt like students were enjoying the freedom to work at their own pace and I wasn’t controlling all steps of their learning. They were engaged and collaboratively working with other students. I once was an opponent of blended learning because I felt that kids were already in front of screens entirely too much but after seeing the results I’ve had in the very few lessons I’ve taught, I was wrong. I only problem I see in my school is that not all teachers are teaching blended learning. Do you think it will a determent to students who only see this blended learning sporadically through their school years? I appreciate you sharing your initial skepticism as I am sure you are not the only educator who has questioned whether or not blended learning is a good thing for kids. I still wrestle with the balance of online and offline activities because I, too, worry about too much screen time and not enough face-to-face conversation and collaboration. That said, I’ve seen what you have seen…the power of technology to allow students to become independent learners working at their own pace. Since I’ve always been the only teacher my students have using a blended learning model, I’ve heard a lot from my own students about what they like in my class compared to their more traditional classes. I wish more teachers used these models, but I don’t think it’s a problem if students are only exposed to this in a handful of classes. I think they appreciate the variety! I am planning how to use station rotation in visual arts. There are different tasks when doing projects. I think it would help greatly for students to move to tables to complete a specific task at each station before moving to the next table. We are going to use the blended learning/station rotation model for our French and Spanish classrooms next year. Levels 1-5 are taught. This is an international school with many ESL students and other students with different abilities. We are going to do 20-30 minutes of teacher-centered learning, 20 minutes of reading, 20 minutes of video and auditory comprehension. The school has an A/B rotating schedule. Since we lack space we are going to combine the languages in two classrooms. Does this sound feasible? Thank you. The station rotation is super flexible, so I definitely think that could work. It will be nice to have the group broken into three stations so you can focus your attention on the students at your teacher-led station. I also like the mix of offline and online tasks. Too often, I see teachers design every station using technology and students get burnt out on the screen. I’d even consider throwing in a conversation station where kids are paired up having discussions in their second language. These informal conversations can help to build their speaking and listening skills, which is so important in a language class. Thank you, Catlin. I am just seeing this response. Interestingly enough, it has taken us over a year to implement this (we needed new furniture, technology, etc). I think this will work quite well. Hello! I read your post about not taking grading home anymore, and loved it, and stumbled my way onto this post. I have made some lame attempts at this station rotation model, without officially calling it that, but really want to perfect it, especially for how I want to teach writing. I am curious about you introduce this to your student. Do you have a set of expectations? Do students help create those? Do you have a run through with something fairly simple to get the idea? Are there certain topics that work better for this than others that you would recommend? I am going to be teaching a block classs next year for the first time as I move to a new school and will have roughly 30-34 kids in a section. I’m used to much smaller classes of 22-25 for only 50 minutes, so I’m really wanting to invest some time this summer in researching this idea more. I spend a bit of time “laying the foundation” for online and face-to-face work. Students play an active role in articulating expectations for work done in class and online, as well as articulate the consequences for missteps. 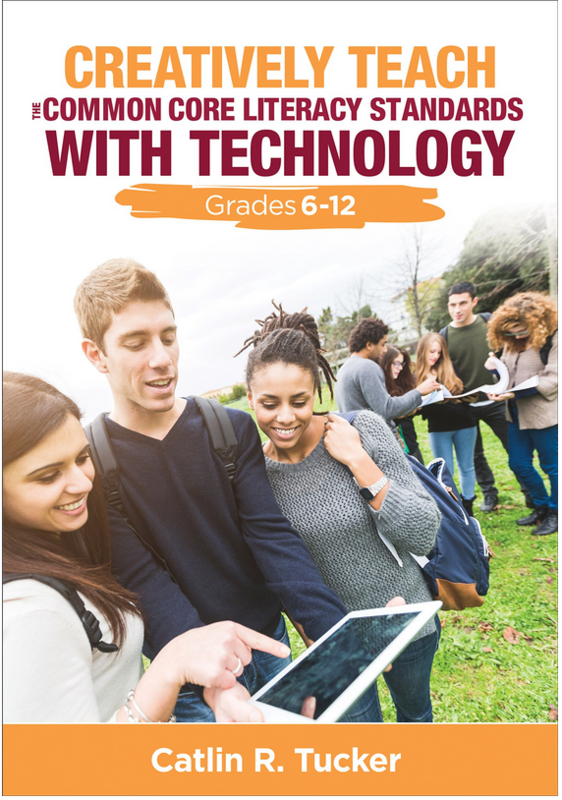 In my first book, Blended Learning in Grades 4-12, I talk a lot about being intentional about creating a safe space and building community online. 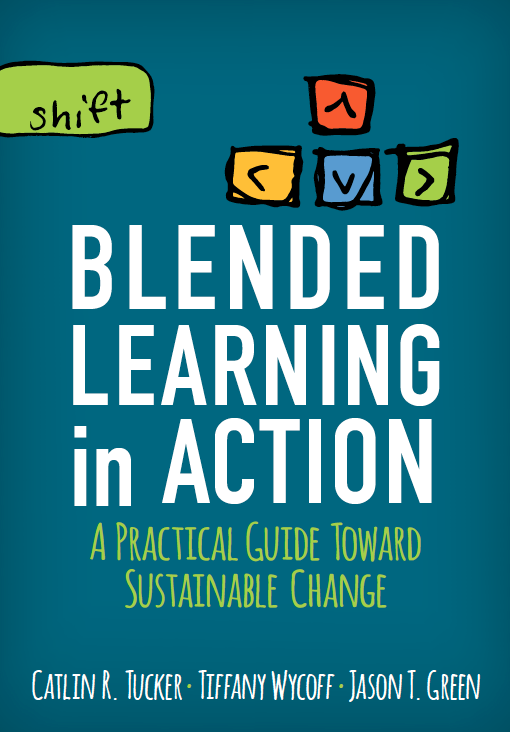 In my newest book, Blended Learning in Action, I cover the various models and talk about how to design different types of lessons and creatively troubleshoot common challenges. Those might be useful to you as you work to prepare for next year. I’m a big fan of the block schedule, so I think that will make implementing a Station Rotation Model much easier. Thank you so much for tweeting this again! I really would like to do a station rotation model, but I’m struggling with making sure all of my students are accessing the same information. In the past, I used history notes. Do you have any examples of how a history teacher has replaced their notes with the station rotation model? I still would like to have a unit test at the end. Most of my questions are DOK 2 or 3. I’ve worked with history teachers who marry the flipped classroom and the station rotation to create an in-class flip. This provides a way for them to introduce information and allow students to self-pace through that information in a station. Caitlin, Love Love Love this!! I am trying to prep for a transition to a blended learning classroom. I love this model and just had a few questions. I teach 5-8 math and realize that your stations may not exactly match what I need, however, would you be able to give me an example of what students do in the self directed and self paced stations (with and without devices) and the collaborative work with devices? Here is a link to a rotation lesson I designed for a math class that might help give you a visual. Hai Catlin, Can you explain for me more details about what student going to do fr every station? More details. #1 Teacher-led station where I provide small group instruction about how to actively read a text or introduce quotes in an essay. #2 Online practice with NoRedInk for grammar. #3 Student-led discussion about the text we are reading. There is a group facilitator and I provide questions or they generate them prior to the discussion. #4 Research as historical time period connected to the text we are reading and create a visual timeline. I cover example lessons in my book Blended Learning in Action if you are really curious about this model. Hi Caitlin: I love your station rotations. But I have one question. I find it difficult to create stations of equal duration, especially in a classroom with learners of differing abilities. It seems that one or two stations always finish before the others. Students pace through activities at different rates, so I have a “next steps” list on my whiteboard. It is a list of activities and tasks for students to work on if they finish at a station before we rotate. The first item always directs them to return to any task they did not complete at a previous station. Then I have things like, 1) log into Vocabulary.com and practice your vocabulary words, 2) read and annotate to page #, etc. That is the best strategy I’ve found for dealing with students who pace quickly through a station or a station that takes less time than the others. Hi Caitlin. We are creating a Vanguard Program at my school here in Hershey, PA. The focus is on moving towards a blended model, utilizing many of the ideas you discuss on Twitter and here. I really appreciate the time you take to share what you are doing. Question–I taught ELA for 17 years before taking my current position as a learning tech specialist. I incorporated a blended approach on many days (not enough, sadly) but the struggle for me was always with assessing. When you throw so many activities into the mix, how do we hold students accountable for these different activities, especially when the focus is on keeping grading in-house rather than taking it home. Thank you so much. I talk about how I’ve moved assessment into the classroom in the blogs below. I also don’t grade everything students do in stations. I focus on keeping activities varied and interesting. I do not use points as carrots to get kids to do work. Some of the work they do in stations is just practice to prepare for assessment, which will be graded. blog; I love it! Thank you for sharing your great ideas!! It would be nice having an example of a Station Rotation Model class. 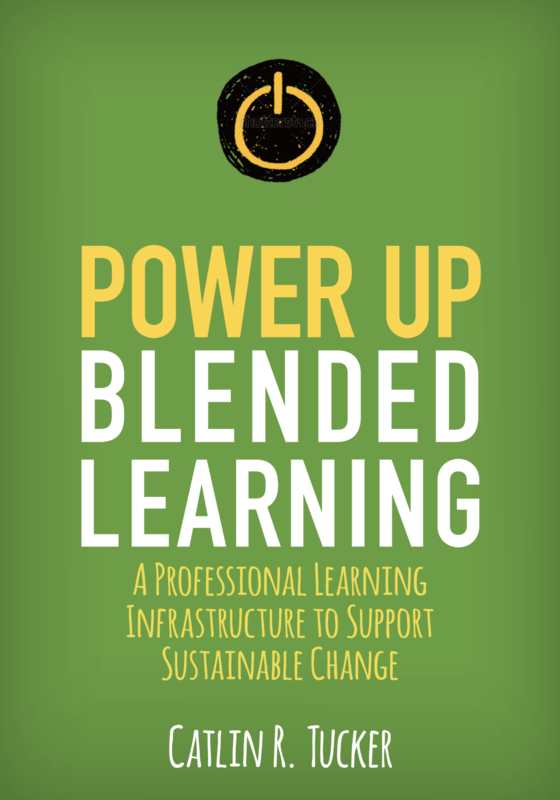 If you are looking for example lessons, I have several in my book Blended Learning in Action. That might be a useful resource as it covers grouping strategies, lesson design, and other challenges/solutions related to the station rotation model. I am writing you form Chile. I am currently doing my last Professional Practicum and the traditional PPP model is not working. Therefore, I thought it would be a good idea to mix the rotation center model with the task based learning. This was the way I came across blended learning. How do you think I could apply task based learning to BL?…since latin american teens are not really used to independent work, leaving them on their own while I am teaching a small group would end in chaos. How do you recommend me to transform this?…I am planning to use this system for my supervision soon, your advice would be really helpful. Thanks! and greetings from Chile. You can use the Station Rotation Model and design stations that are collaborative in nature. Students do not have to work individually in this model. In fact, I love designing stations that are grounded in collaboration, conversation, and creation. Below are some examples of stations I use that are not individual. I hope these suggestions are helpful. I am a big believer that technology should be used to connect students instead of isolating them.